LUNA: Action: PURIFY. Power: UNIVERSAL WATER. Essence: FLOW. Magnetic Portal identifies the purpose. What is my goal? 215 days left for the start of the New Age. 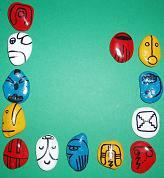 Initiate the Wavespell of the Red Moon, Nº 17 Tzolkin. With it begins the Green Central Castle of Enchantment. We at Rhythmic Lizard Moon of Equality (see Moon http://ondaencantada.com/2012/12/noosboletin-de-la-luna-ritmica-del-lagarto-de-la-igualdad/). This represents the Moon out of time preceding the 7 Mystic Moons, which are the remaining seven years to finish the Storm 7. The Archetype Galactic Moon 9 is the healer. 12/21/2012 we have lived, that is the end of the 13-baktun cycle of history, which began on August 13 of the year 3113 BC. What happened on that day? As I write this Wavespell of the Moon, there are still 10 days to the appointed time. There are many expectations and hopes placed for many years, in which the vibrations are raised on the planet and that we can live and experience the New Era firsthand. It is the time when you complete the synchronization beam 12:60, it took a year to 12 months and time of 60 minutes, and that the new time begins 13:20, 13 tones and 20 seals that also equals the 13 joints in the body and 20 fingers and toes. We are currently living in full calendar of 13 Moons of 28 days, plus 13×28 = 364 365 Day Out of Time and the 260 day Tzolkin fully harmonized. From 22/12/2012 to 07/26/2013, the remaining 216 days, are preparing for the start of the New Age in year Yellow Galactic Seed. The Moon has three qualities: PURIFY, UNIVERSAL WATER AND FLOW. We begin by PURIFYING their action. It is important to know what it means according to the dictionary of the RAE PURIFY: “Cleaning of all imperfection something material” and “Remove from something which is foreign, leaving him in being and perfection which must have as its quality.”What causality! That is what we are doing in our spiritual journey. Since the beginning of time, we have been perfecting in the immaterial, in the interior, raising the vibration, raising consciousness, to get here and now. We know that we have come a long way and many lives. We learned to do well and to be kind. The environment has also changed, to live in caves, in houses of clay, mud, wood, cement until the “skyscraper” metal and glass high-rise, in large cities. The quality of life has improved and supposedly thereby changed the habits of humans. But this is the question, have we improved also in consciousness? Are we loved more understanding, loving, compassionate, and happy and detached? Or on the other hand there are still glimpses of selfishness, bitterness, hatred, envy, pride, fear and unhappiness? All we have is- we are to purify, release, and dismiss him from our lives. We leave everything to be bathed by the power of UNIVERSAL WATER. We can imagine getting a shower of special powers, different colors and that water energy enters our body, brightening dark portions that need to reach the light. This water that bathes us, is for everyone and everything, so it is universal, that is the Universe, with the specific aim of helping you and me, along with all other beings on the planet Earth, to heal internally. When we need to free ourselves from an emotion, simply let us bathe in universal water, which is carried to transmute suffering into love. No need to suffer, accept this as presents and thank God for the strength and courage that gives us to heal the body internally and / or externally. If you have a disease, so we bless taught and the surrender to God, and we continue to love all equally and even more than before. The disease can have many origins and purposes, so no emotional guilt she okay? The essence of the Moon is the FLOW. I think we all remember what is flowing, especially when we’re stuck without seeing output problems at a particular time. Flow also means being above situations that cannot surround harmony, and hope to overcome or live as peacefully as possible with them. Everything will be changing on these moons. The Earth will receive higher vibrating energies, and our bodies and minds will adapt to them. It is an adjustment that may initially bring some disorder, but later to relocate things after the cosmic order. The Rainbow Bridge is visible through the efforts of all planetary kin, and does its work around the Earth. We are sensing the arrival of the Noosphere with all packets, as said Valum Votan. We must be prepared for that channel of light that humans need now historic passage of the Biosphere, or sphere of life, the Noosphere, or sphere of mind. Let’s make true the SAYING TIME IS ART! WE CAN USE ALL THE RESOURCES WE HAVE DONE THE EARTH NATURALLY, LIKE CRYSTALS, PLANTS, TREES, CAVES, RAYS OF THE SUN AND THE MOON, THE RAIN, WIND, WATER SPRINGS AND MARES VOLCANOES OF FIRE, THE AROMA OF NATURE, THE CONTACT -MAGICAL BEINGS ELEMENTALS OF NATURE THAT INHABIT FORESTS, TREES, FIRE, AIR AND WATER. ALL ARE WITHIN OUR REACH WITH UPCONVERTING INTERIOR ONLY! DO YOU SEE THEM? FROM HERE WE ARE COSMICALLY TRANSPORTED INTO THE WAVESPELL OF THE WHITE WIND AND WE MAKE THE MAGNETIC RETURN.